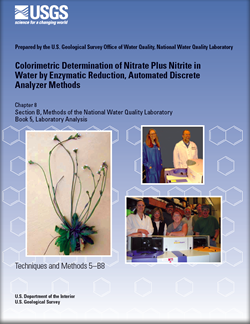 This report documents work at the U.S. Geological Survey (USGS) National Water Quality Laboratory (NWQL) to validate enzymatic reduction, colorimetric determinative methods for nitrate + nitrite in filtered water by automated discrete analysis. In these standard- and low-level methods (USGS I-2547-11 and I-2548-11), nitrate is reduced to nitrite with nontoxic, soluble nitrate reductase rather than toxic, granular, copperized cadmium used in the longstanding USGS automated continuous-flow analyzer methods I-2545-90 (NWQL laboratory code 1975) and I-2546-91 (NWQL laboratory code 1979). Colorimetric reagents used to determine resulting nitrite in aforementioned enzymatic- and cadmium-reduction methods are identical. The enzyme used in these discrete analyzer methods, designated AtNaR2 by its manufacturer, is produced by recombinant expression of the nitrate reductase gene from wall cress (Arabidopsis thaliana) in the yeast Pichia pastoris. Unlike other commercially available nitrate reductases we evaluated, AtNaR2 maintains high activity at 37°C and is not inhibited by high-phenolic-content humic acids at reaction temperatures in the range of 20°C to 37°C. These previously unrecognized AtNaR2 characteristics are essential for successful performance of discrete analyzer nitrate + nitrite assays (henceforth, DA-AtNaR2) described here. Method detection levels (or limits; MDL) estimated for standard- and low-level DA-AtNaR2 nitrate + nitrite methods were 0.02 milligrams nitrogen per liter (mg-N/L) and 0.002 mg-N/L, respectively, which are comparable to 2010 NWQL long-term MDLs of the continuous-flow analyzer, cadmium-reduction methods (henceforth, CFA-CdR) they replace. Typically, reagent-water blanks for standard- and low-level DAAtNaR2 nitrate + nitrite methods are one half MDL or less. Nitrate + nitrite concentration differences for between-day replicates were 3 percent or less at or above 5 times the MDL and were as great as 35 percent near the MDL. Typically, nitrate spike recoveries from reagent water, surface water, groundwater, and high-phenolic-content, humic-acid-amended reagent water were 100±20 percent. In addition to operational details and performance benchmarks for these new DA-AtNaR2 nitrate + nitrite assays, this report also provides results of interference studies for common inorganic and organic matrix constituents at 1, 10, and 100 times their median concentrations in surface-water and groundwater samples submitted annually to the NWQL for nitrate + nitrite analyses. Paired t-test and Wilcoxon signed-rank statistical analyses of results determined by CFA-CdR methods and DA-AtNaR2 methods indicate that nitrate concentration differences between population means or sign ranks were either statistically equivalent to zero at the 95 percent confidence level (p ≥ 0.05) or analytically equivalent to zero—that is, when p < 0.05, concentration differences between population means or medians were less than MDLs. 1 U.S. Geological Survey, National Water Quality Laboratory, Denver, Colo.
2 Veterans Health Administration, VISN 21 Pharmacy Benefits Management Group, Reno, Nev.
Patton, C.J., and Kryskalla, J.R., 2011, Colorimetric determination of nitrate plus nitrite in water by enzymatic reduction, automated discrete analyzer methods: U.S. Geological Survey Techniques and Methods, book 5, chap. B8, 34 p.